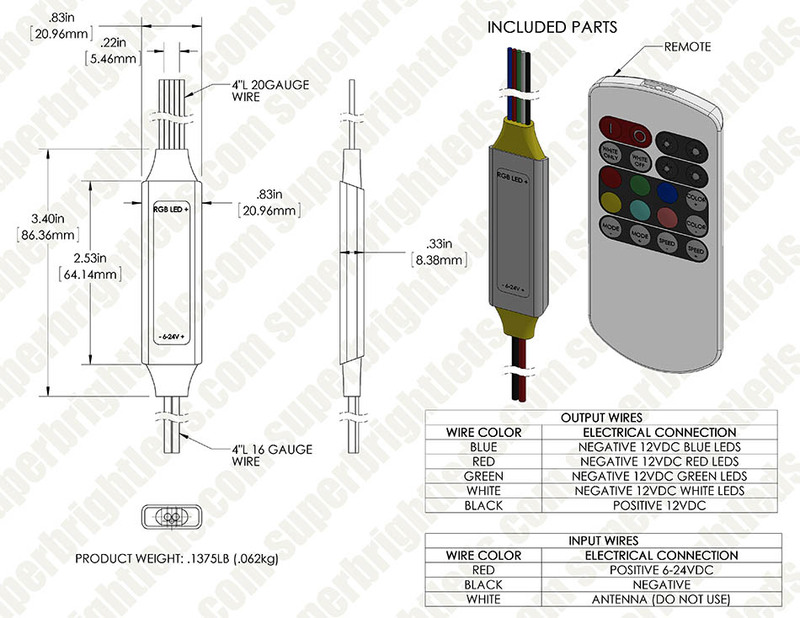 Mini RGB+W Controller with RF Remote - Dynamic Color-Changing Modes - 4 Amps/Channel: 360° View. 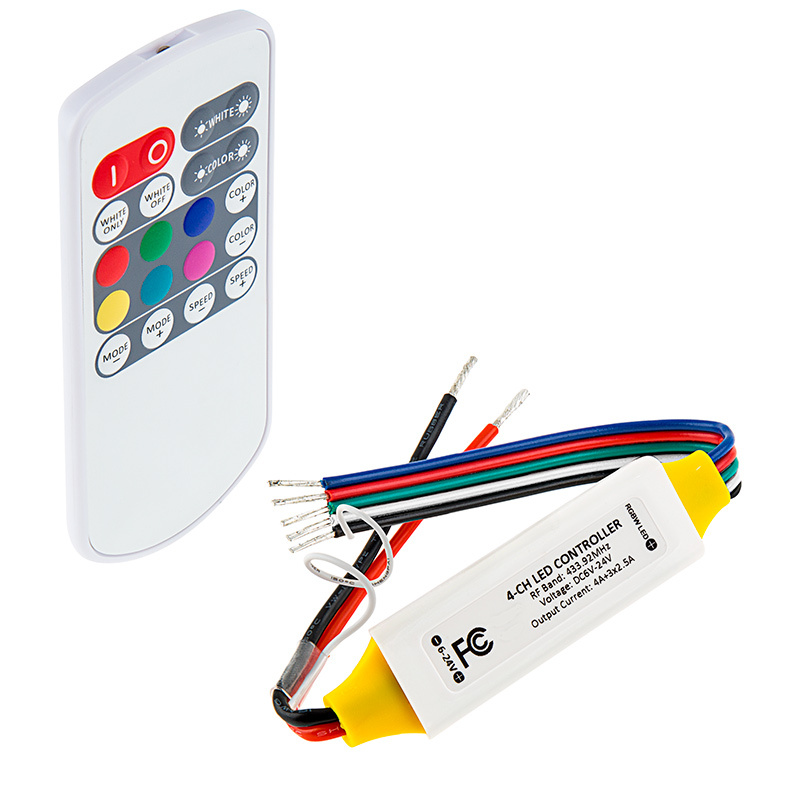 This mini RGBW LED controller with wireless RF remote is perfect for controlling your RGBW LED light strips. The LED remote can dim light strips from 4%-100% using Pulse Width Modulation (PWM). Choose from 34 dynamic color-changing modes with adjustable speed and brightness levels or 30 static color modes with adjustable brightness levels, and control your light strip from up to 50' away. 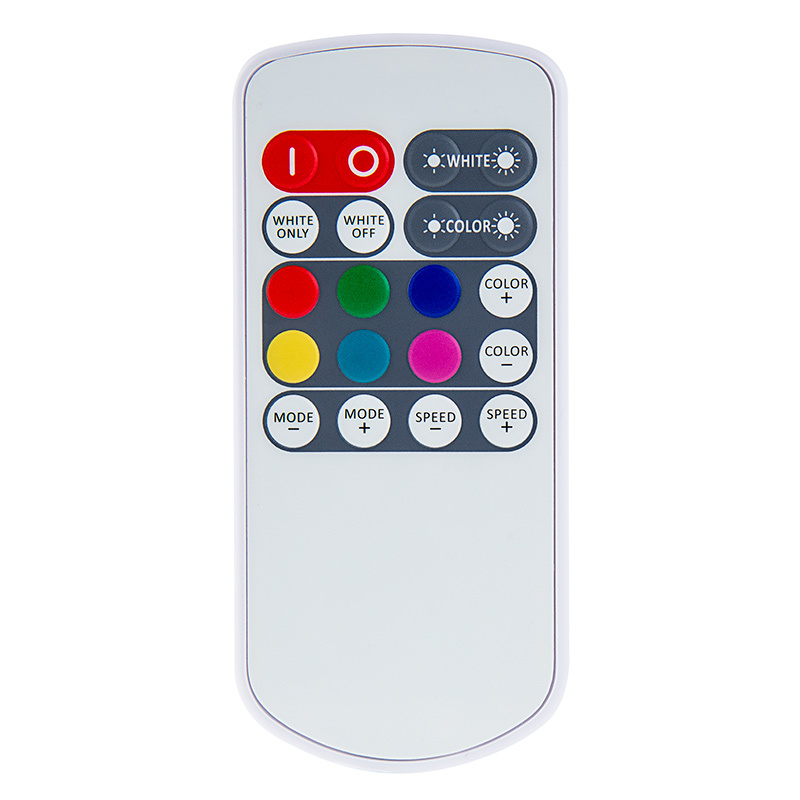 The LED remote features quick-access buttons that allow you to activate only white color or only RGB colors and also has separate white and color brightness buttons. Power-cycle mode retention allows your light strip to return to the mode that was selected before it was powered off. The waterproof controller has a maximum load capacity of 2.5 amps per red, green, or blue channel and 4 amps for the white channel. Compatible with LED light strips that operate within a 6-24 VDC range. Pair up to 5 remotes with the controller. Includes remote battery. Press ‘I’ key to turn on unit or press ‘O’ key to turn off. At power on, unit will automatically turn on and restore the previous settings. These two keys control white LED working mode. Press 'WHITE ONLY' key, all RGB colors will turn off and only white LED lights up. Press 'WHITE OFF' key, the white LED will turn off and RGB LED remains on it's previous status. Adjust white LED brightness. Press the right side key to increase white LED brightness and the left side key to decrease white LED brightness. These keys control the RGB static color. a) Pressing the color printed keys will set the RGB LEDs to correspond color light as the key. There are 6 shortcut color keys to make direct color selection. b) Press 'COLOR+' and 'COLOR-' to scroll over all preset static colors, including the 6 shortcut key colors. Adjust RGB color brightness. Press the right side key to increase RGB LED brightness and the left side key to decrease RGB LED brightness. These keys control the RGB dynamic modes. a) Press 'MODE+' and 'MODE-' key to select preset dynamic modes. b) Press 'SPEED+' and 'SPEED-' to control the dynamic mode running speed. The blue indicator will blink when remote control is transmitting a command. The remote controller works at radio frequency. The remote controller's use is not restricted by normal obstructions such as walls, doors, etc. The red power cable should be connected to power positive and black to negative. The controller unit can work from DC 6V to 24V, Please make sure the power supply voltage is same as the LED load and the power supply is adequite for the circuit. This controller supports constant voltage driving LED products with a common anode connection. The black cable on the ouput side is the common anode, it connects to the power supply positive inside the controller. The white, green, red and blue cable runs the driving signal of relevant LED color, please connect the color cable to the cathode of relevant color LED loads and the black cable to the common anode. The is a full color status indicator. It displays all working statuses of the controller. It indicates different events as following: Blue: normal working. Short single white flash: new command executed. Long single white flash: reach mode or color cycle edge. Long single yellow flash: reach speed or brightness limit. RGBW LED Strip Lights - 12V LED Tape Light w/ White and Multicolor LEDs - 245 Lumens/ft.